So the UIAA sets a major fall (fall after which to retire your gear) to be a fall factor of 1.77. Now I was wondering what would count as a major load (load after which to retire your gear) ? 50 kN ? More? Less ? In the petzl document "tips for protecting your equipment" they don't seem to make a distinction between metal gear and ropes. So is that the same for all ? Your equipment should all come with a Kn rating. this is the force that that piece of gear will hold (often in what direction). 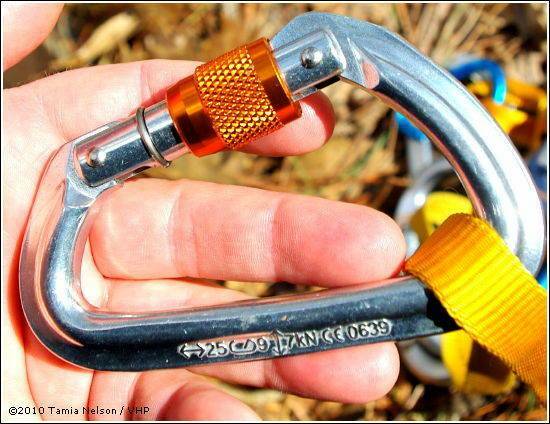 All pieces of gear should come with these ratings written on them somewhere or in the documentation included (this includes ropes). Different pieces of gear will hold different kns and they all vary slightly so you need to check the rating of that particular gear. One other thing to bear in mind is the strength of the rock. There is no use putting a 20Kn cam into soft brittle rock. The cam may hold the fall but if the rock gives way it doesn't matter. The fall factor and the maximum load are not independent parameters. WP has a formula that expresses the maximum load in terms of the climber's body mass and the fall factor. Since people's body masses are all on the same order of magnitude, the fall factor almost completely determines the maximum load. Physically, the maximum load is probably the most relevant thing that determines what bad things will happen to the rope, climber, and gear. (It's also possible that total energy dissipation could make a difference.) But since maximum load is essentially determined by fall factor, all you really have to worry about is a single number, which is the fall factor. This is good, because fall factors are easy to estimate while climbing, but it's not practical to estimate while you're climbing how big the dynamic load will be from a lead fall. Not the answer you're looking for? Browse other questions tagged gear safety ropes gear-care or ask your own question. Why should the angle in a rope attached to two anchors be 60 degrees or less? Climbing gear: can the energy absorbers of a lanyard for via ferratas be used only once? Major fall, same for static and dynamic? How much gear will the AT eat? How big a fall is a “major” fall? How to achieve a climbing anchor that can withstand an upward load? Why do some climbing ropes have smaller load bearing than some paracords?